How the Uniform Commercial Code Supports State Lemon Laws | The Consumer Law Group, P.C. If my Lemon Law case crosses state lines, will the UCC help? While the rights guaranteed by Virginia’s Lemon Law are relatively easy to navigate, when your Lemon Law claim involves a state other than Virginia, you may run into complications. If you purchased your vehicle in Maryland, for example, the differences between their Lemon Law and ours may make pursuing a claim more difficult. When this happens, the set of national guidelines known as the Uniform Commercial Code (UCC) may be of assistance in your case. The UCC is a collection of legal rules and standards relating to various commercial activities. Originally drafted by legal scholars in 1952, the UCC has been amended over the years and parts of it have been adopted by all 50 states and the District of Columbia. While it is a lengthy document full of legalese, an experienced consumer attorney will know which standards apply in Virginia and will help in a particular case. In general, Article 2 of the UCC, which governs contracts for the sale of goods, applies to car buyers with significant non-compliance issues. 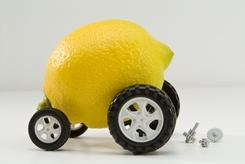 How Can the UCC Help in a Lemon Law Claim? Tender. This gives consumers the right to refuse to accept any goods that do not comply with the contract. This is difficult with cars as most consumers are unable to identify mechanical problems on sight. The UCC calls this "rejection", which must occur before you drive away. Acceptance. When accepting goods, consumers are doing so with the assumption that the manufacturer will honor any warranty agreements. Revocation. If, after a period of time, you discover that the car does not conform to the contract agreement, you may revoke your acceptance of the car. In Virginia after notifying the seller in writing that you are revoking acceptance, you cannot continue to use the product. Virginia’s Lemon Law spells out the exact terms for returning a new car and recovering all expenses, so you would not need to invoke the UCC for a Lemon Law case in Virginia. However, if your case involves a dealership in a state that does not have a similar law, or the time to use the Lemon Law has expired, your attorney may be able to use provisions of the UCC to support your claim. Call The Consumer Law Group, P.C. If you are unable to settle a Lemon Law claim directly with the dealer or manufacturer, you may need the help of an experienced Virginia Lemon Law attorney. Fill out the claim form on this page and we will be in touch promptly.